As soon as I found out that this movie was gonna be released on DVD in an “unrated” edition, I knew I could hold off seeing it in the theaters. It’s not that I craved more profanity or violence, it’s just that all the other Die Hard movies were rated R and it just isn’t the same any other way. It saddened me that director Len Wiseman was willing to dumb down the consistency of this film series in order to possible garner more PG-13 money. Didn’t they realize that if fans see another “Die Hard” movie coming out, they’re wouldn’t be paying attention to what the rating is? They’ll just want something bigger or different to go with their familiar main character. Since it’s been twelve years since the last movie, everything about this new one would be scrutinized to ensure that the quality, consistency (there’s that word again) and characterization in this new film would be intact. The verdict: it’s a solid over-the-top Bruce Willis action movie, but this isn’t John McClane. 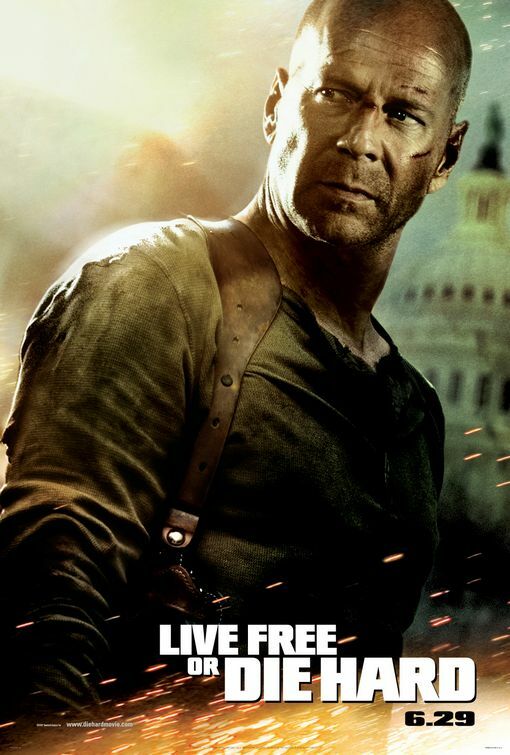 “Live Free” (a silly title) just doesn’t feel like a Die Hard movie and before I go into the reasons why, I’ll just go ahead and give you the rundown. 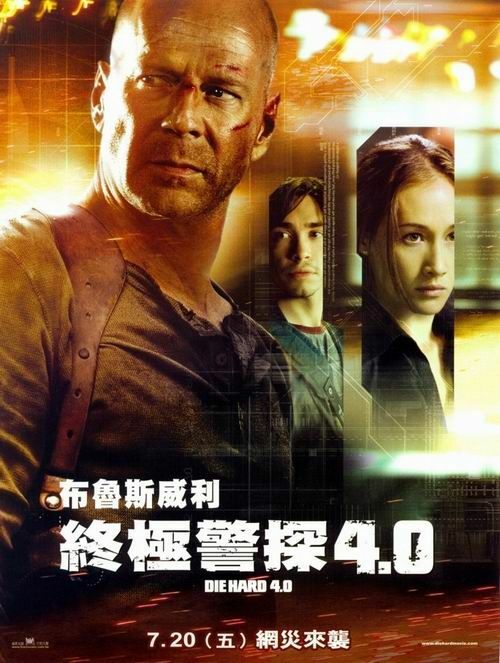 The film opens up with a handful of cyber-geek hackers being eliminated after they unknowingly assisted the requisite bad guy infiltrate the FBI’s computer system. The killings are untraceable since once these hackers delete a message from our bad guy they explode into fiery oblivion along with everything else around them. Around the same time, in the wee small hours of the morning, the FBI realize something is up and call upon that NYPD to follow-up on any and all hackers that could possibly be doing this. Computer geek Matthew Harrell (Justin Long) fits this description and it falls to the responsibility of a certain veteran detective named John McClane (Bruce Willis) to pay him a visit the kid at his apartment in Jersey. This is here where we become re-introduced to the iconic character that ignited Willis’ career and it’s a re-introduction that I’ll touch on later. The interplay between analog McClane and digital Harrell is immediately enjoyable. It’s easy to see where it’s all going. These two will buddy up and get involved in all sorts of action which will require both of them doing what they do best – mayhem and hilarity ensued. McClane winds up saving the kid from permanent deletion when the stereotypically foreign-accented bad guys attack his apartment. From that point on these two are on the run from terrorists, naturally. Along the way, the father and son-like duo run into some requisite supporting characters. Some of them play on the good guys side, like Special Agent Bowman (the always great Cliff Curtis), McClane’s daughter, Lucy (Mary Elizabeth Winstead) and the distracting presence of actor/director Kevin Smith as a computer guru named Warlock. The odd thing I found with many of the bad guy lackeys is that they were Italian (say what? Italian terrorists?) with no explanation as to how they hooked up with their American leader. On that note, it would’ve been nice to see this guy switch roles with his right-hand woman, Mai (Maggie Q) who at least had a formidable presence. Plus, it would’ve been refreshing for a woman to be the villain in a movie like this. Ah well. As for that main bag guy, he’s a ruthless….computer whiz (?!?!) named Thomas Gabriel (Timothy Olyphant), who’s taken over most of America’s computerized systems, causing mass chaos nationwide. Young Harrell has to break this all down for McClane, of course, as they witness various traffic and power calamity on the way to DC’s FBI branch. The premise is absolutely preposterous, but that’s never really been a problem for the “Die Hard” movies before and might even honestly be considered one of the series’ hallmarks. That being said, it’s still the least plausible of any of the “Die Hard” stories so far, and that even includes terrorists taking over an airport in “Die Hard 2: Die Harder”. It should also be noted that this is the first “Die Hard” film where McClane doesn’t buddy up with an African-American. Instead, we’re given a generation gap to keep things interesting. Willis and Long manage to establish a fairly amusing rapport early on, and it’s this dynamic that keeps things rolling through a few rough patches. Anyone knows that a great action movie must always be measured by the threat though….or how “bad” the bad guy is. This is, unfortunately where the film goes limp. Olyphant is just miscast. He comes across as a crybaby who didn’t get what he wanted and is now lashing back at “the system” like a wounded dog who uses “the system” against itself. Interesting tactic, but his evil intentions aren’t convincing enough and are basically MIA for most of the film. Once you accept that siding with or understanding the villain isn’t what this entertaining action flick is about, you can kick back and have a good time. Back to my biggest problem, which is that re-introduction I mentioned. Willis looks great but he just doesn’t look like the McClane we know. I know, it seems picky but characterization is integral here. 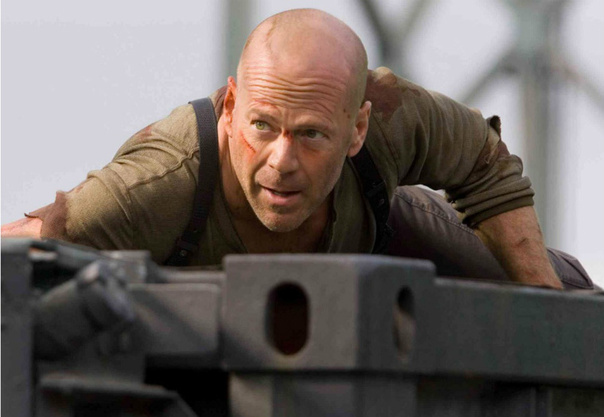 McClane isn’t “Bruce Willis: Action Star”, but his shaved bald head communicates a different character. He’s totally serious, lean and trim. What happened to the stinkin’ whino that they peeled off the floor in the last movie? That endearing, frazzle-haired louse is missing here with no explanation as to how he upgraded to superhero. So, instead we’re given Willis and not McClane. Not that I didn’t enjoy seeing the actor run around, but he didn’t look like John McClane, which was just a little jarring for my continuity-conscious mind. Inevitably, action movies must adapt due to changing times, yet the whole computer hacker bit feels done to death. It’s probably a challenge to develop a good script for a McClane movie since viewers are inundated with all these tech-savvy Jack Bauer types. This time around McClane was this unstoppable supercop and that’s fine – if we want to consider it a Bruce Willis action flick. You can’t tell me that McClane wouldn’t have had several broken bones, a punctured lung and some severe burns as he jumps onto the top of a flying fighter jet. Maybe I should go easy on “Live Free” since this is a summer blockbuster which will find the believability factor thrown out the windshield. That being said, the action here is expectantly brisk and non-stop: baddies are dispatched violently, car chases come fast and furious and explosions abound aplenty. McClane has almost become a caricature of the tough, wisecracking cop we first met in 1988, although there are still traces of mortality at times, but the danger doesn’t feel quite as perilous anymore. We could almost substitute Jack Bauer himself in John McClane’s role – and let’s be honest, it really wouldn’t change much. It would’ve been cool if the setting of the film went back to Christmas time like in the first two but I can’t have everything. Overall, here’s quite a bit to like here: from the stylishly shot action sequences to the razor-sharp editing and effective comic relief….for a Bruce Willis action film. Once you acknowledge that it’s not a Die Hard movie, you can enjoy it. What it lacks in believability it makes up for in action.